Flooring. It's what we do. 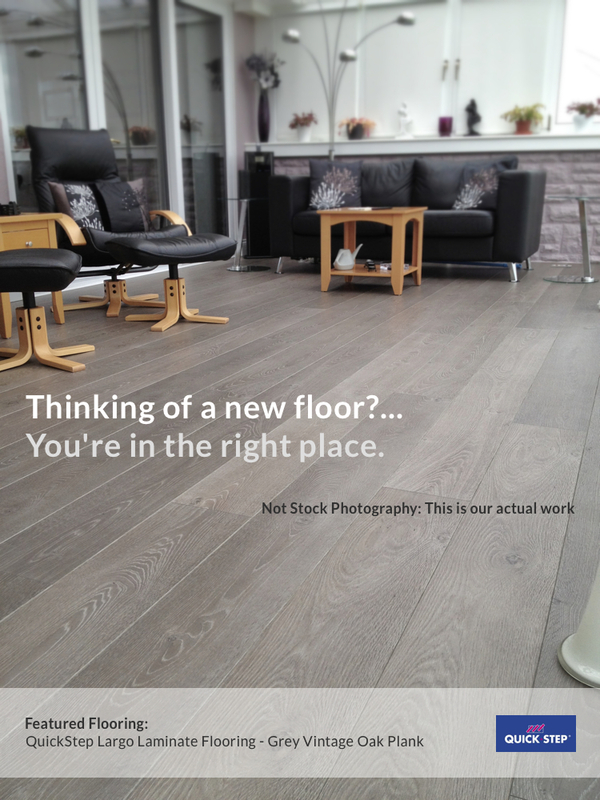 When we say we do all types of flooring we really mean it. Whether you need Carpet, Wood Flooring, Tiling or Vinyl Flooring we can get it done in a quick, clean and efficient way. We have worked closely with some of Gloucestershire's top Conservatory companies, laying tiles for over 15 years now. In that time we have learnt the best ways to set out, lay and finish all types of floor tiles, whether its limestone, slate, porcelain or simply cermaic tiles. 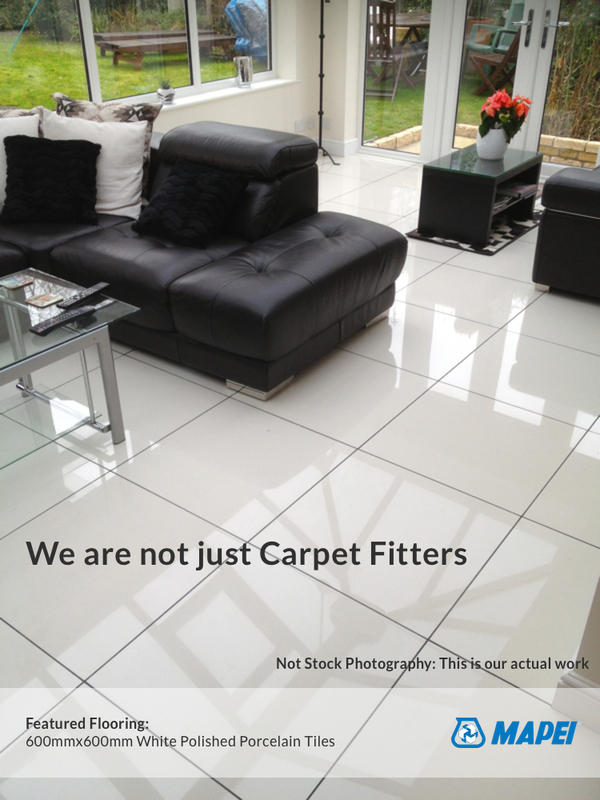 Floor tiling is not something all flooring businesses want to be involved with, but its one of our major occupations. It requires a range of specialist equipment. You can often tell a flat tiled floor by looking at the reflections in the tiles. As you will be able to see in the feature picture here, the relections of the conservatory roof and windows line up almost perfectly which is a good indication that the tiles are indeed flat. This is especially important when laying polished tiles like these. For even flatter tiles we now use a patented tile leveling system developed in Australia, rarely used in the UK. Choosing the correct adhesive is another important part of tiling. We prefer to supply our own adhesives from manufacturers like Mapei, which are specifically selected for the type of tile and sub floor environment. All customers need do is choose their own tiles and grout combination. You can leave the technical stuff to us. We are able to fit tiles upto 900mm x 900mm. The majority of jobs are tiled, grouted and cleaned the same day. Every Now and then there is a noticeable trend towards certain types of flooring, styles or colours. Stripey Carpets are one of those latest popular trends. 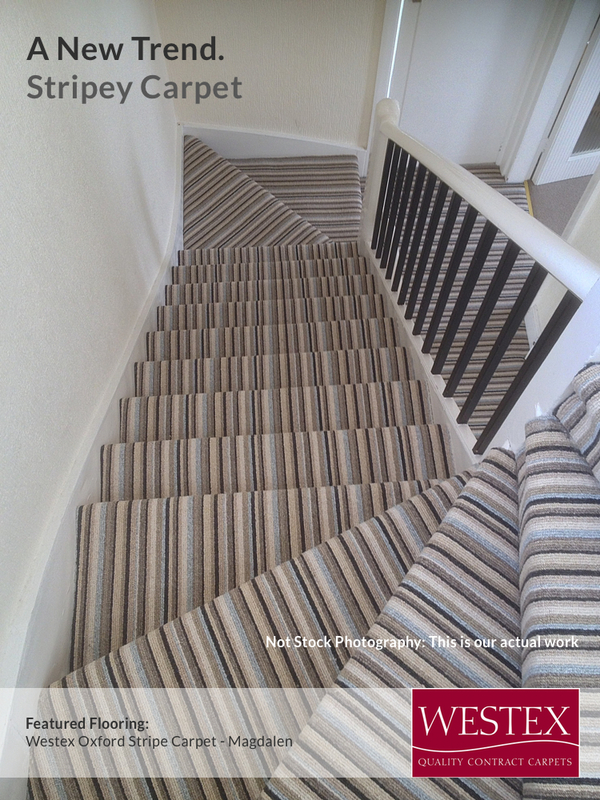 Stripey Carpet comes in a variety of qualities with prices to suit any budget. Ideal for stairs, landing or hallways. Stripey Carpet has become trendy for Hallways, Landings and Stairs in recent years but there is no reason why they can't be used to make a statement in a larger room. They present a unique challenge to carpet fitters. The stripes obviously need to match up over each step, and still be parallel with walls and also not be stretched out of straight at all. With a plain carpet this is not something that you'd normally need to worry about too much. So careful planning and experience is required when laying Stripey Carpet. Real Wood Flooring can be solid timber or better, engineered multi-layer Wood Flooring. 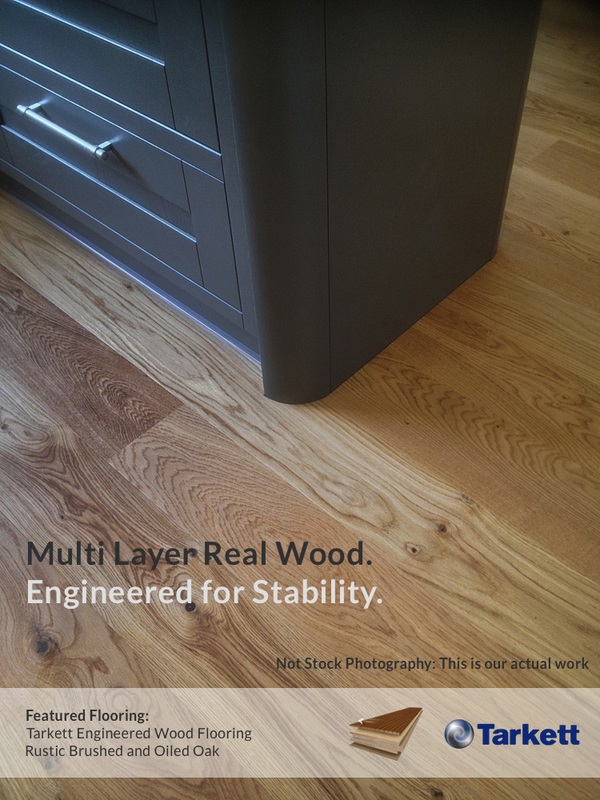 Engineered Wood Flooring is designed for stability and can be used over underfloor heating systems. Solid Wood Flooring however is not recommended over underfloor heating or for use in conservatories and carries an inherent risk of unexpected warping by its very nature. We have tried and used many real wood floors (mainly oak floors) over the years from various manufacturers. Our experience will ensure you are not sold something low grade at a premium price. What is Multi-layer Real Wood Flooring? Multilayer Engineered Wood Flooring is a man made board with a layered construction and a real wood surface, commonly Oak. The majority of the board is often ply or similar and the surface is made from approx 4-6mm of hardwood. They have the same if not better appearance to a solid wood floor, and are often a similar overall thickness. Why is Engineered Flooring better? The soft wood backing on an Engineerd Oak Floor is specially designed to balance the twist and pull of the real Oak surface. This almost eliminates the risk of stability problems within the boards. Multi-layer Engineered Wood Flooring actually solves an environmental problem also. There is less hardwood used and so less need for felling of trees. 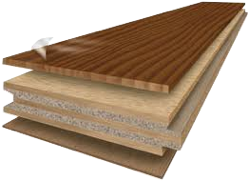 Why use Click System Engineered Wood Flooring? Click System Engineered Wood Floors are machined to a much higher tolerance due to the accuracy required for the click system to work. Slight gaps between boards are more common with traditional tounge and groove solid wood or engineered wood flooring. Skirting Replacement, Undercutting and Door Cutting... All part of the Service. The finishing details can make a job. We understand that customers dont really want beading or scotia when having a new laminate or real wood floor fitted. Thats why we always offer to remove and replace the skirting boards as part of any wood flooring job where possible. Its often a simple task but can seem a daunting one initially. Going that extra mile can be the difference between a good finish and great finish. We'll make sure that your new floor flows seamlessly through door ways and under architraves and door linings to give the impression that the walls were put in after the floor. Before even the first board is laid this needs to be considered as part of the preparation stage. Some floor coverings, particularly real wood flooring which tends to be up to an inch thick can mean that doors need to be adjusted. No need to hire a carpenter as we can remove the doors affected, cut the bottoms and re-hang them. Mobile? Tablet? Desktop?.. Windows? Apple? Android?.. It doesn't matter. Our website adapts to any screen size so that you can view it as intended from anywhere on any platform. The client specifically wanted a hard wearing and high quality wood design for the finished floor in a trendy modern colour. We immediately recomended QuickStep Laminate Flooring. 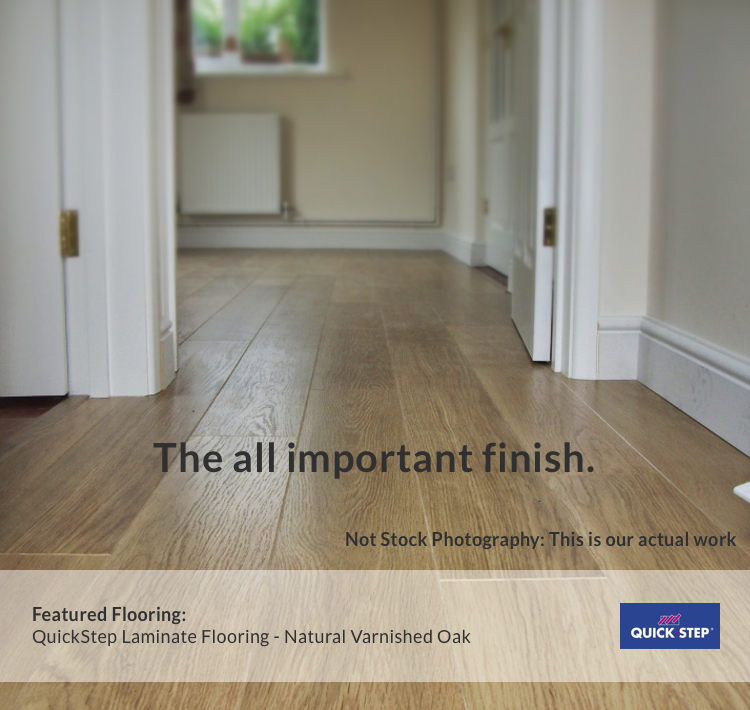 We've used QuickStep Laminate Flooring for over 10 years due to its popularity, excellent appearance, quality and reliablity. Problems are virtually un-heard of.